The Ecosmart diaphragm metering pump from Lewa GmbH. 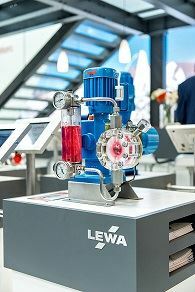 Hannover Messe takes place from 24 to 28 April at the Hanover exhibition centre and Lewa’s focus on hygienic pump heads and valves for the food industry will include the Lewa Ecodos hygienic program for low-pressure applications of < 20 bar, the Pomac double screw spindle pump and the Lewa Ecosmart diaphragm metering pump for highly complex food processing procedures in low-pressure applications. The Lewa Ecoflow pumping process will also be demonstrated live at a pulsation-cavitation demonstration stand. The double screw spindle pump from Pomac has high levels of pressure stability and is especially suitable for products with entrained solids. It can be used up to 16 bar in temperatures of 135°C and can be operated at very high speeds of up to 3,600 U/min. This series is particularly suitable for sensitive and shear-sensitive products as the screws do not touch. The pulsation-cavitation demonstration stand will display the various operating states of a diaphragm metering pump which includes it working with low suction pressure and the influence of pulsation dampers and different pipeline designs. The Lewa team will be available in Hall 15 at the Pumpe DE joint stand in the PUMP PLAZA at Hanover exhibition centre.